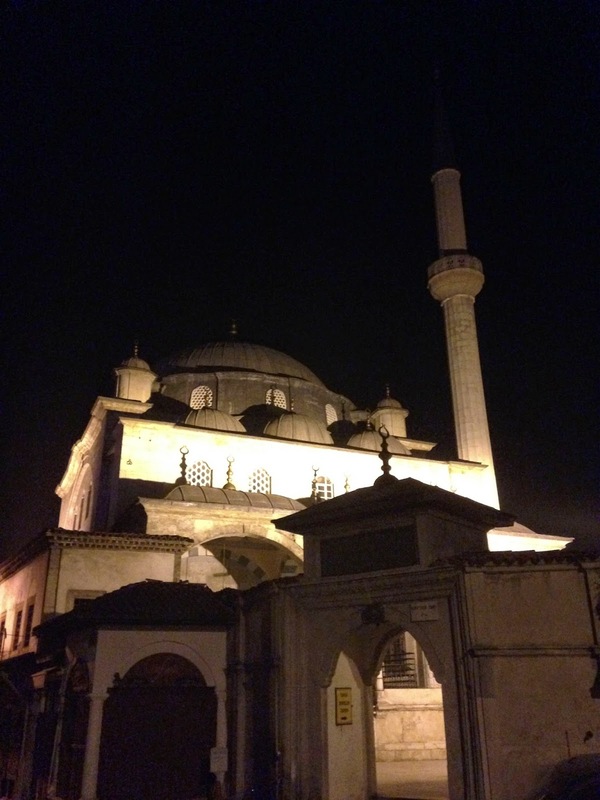 Have Wife Will Travel: Safranbolu - an Ottoman Delight! 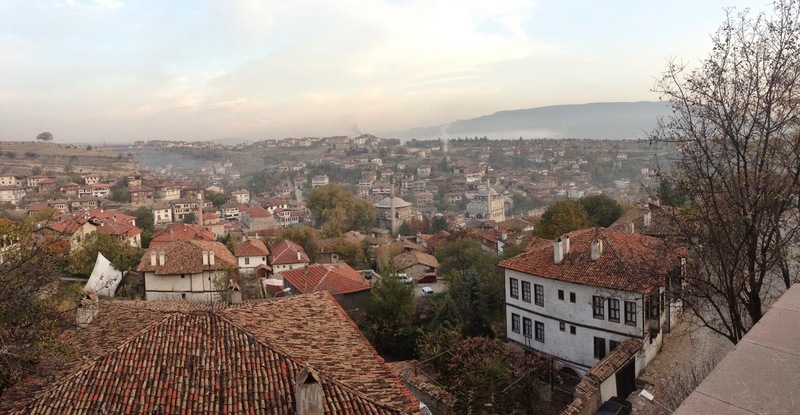 Safranbolu - an Ottoman Delight! We arrived in Safranbolu after a terrible 8 hour bus ride stopping to change buses first in Nevshehir and then in Ankara. Terrible part aside, the Ankara bus terminal was really interesting and looked more like an airport than any bus station we have ever seen, with one level for arrivals, one for departures and another for washing and refueling buses. Unfortunately, the bus station in Safranbolu is almost 3 km outside of town, and even though it was only 6pm it was already quite dark. But to save a few lira on a taxi, we opted to walk to our hotel. Only got really scary when we almost got attacked and eaten by a big dog in a dark alley, but then we arrived safely at our hotel, the Yildiz Konak Pension, and the day immediately got much, much better. The entire town is a UNESCO World Heritage Site, because it is a very well-preserved Ottoman town, with amazing buildings from the 1300's on. The town was named for its importance in the Saffron trade from the 13th century to the 20th century, but once the rail system in Turkey got up and running, it became a side note. Sort of like the Route 66 of Turkey! We were welcomed in to our pension by Fatima, the delightful and welcoming Turkish owner, who spoke almost no English. 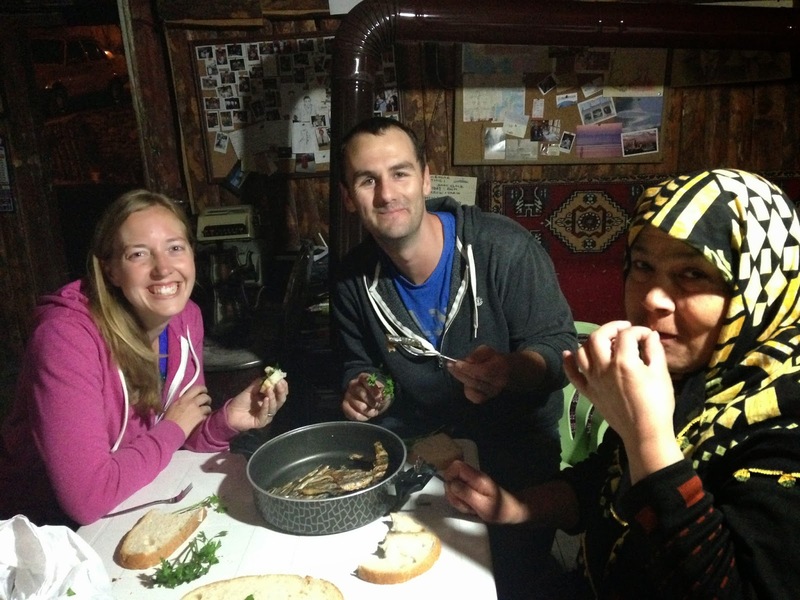 She sat us down and shared her dinner with us: a pan of fried mini fishes, a loaf of bread and some fresh herbs. And tea of course. We "talked" and ate and then watched a Turkish gameshow, while she presumably gave us the play by play on what was happening (in Turkish). Then we started to wonder if we would ever see a room. An hour went by and I really needed a shower, but how to get there communication-wise? Turns our we just needed to stop accepting her offers for more tea! She took us to our room and we had a nice 3 days as the only guests in the hotel. 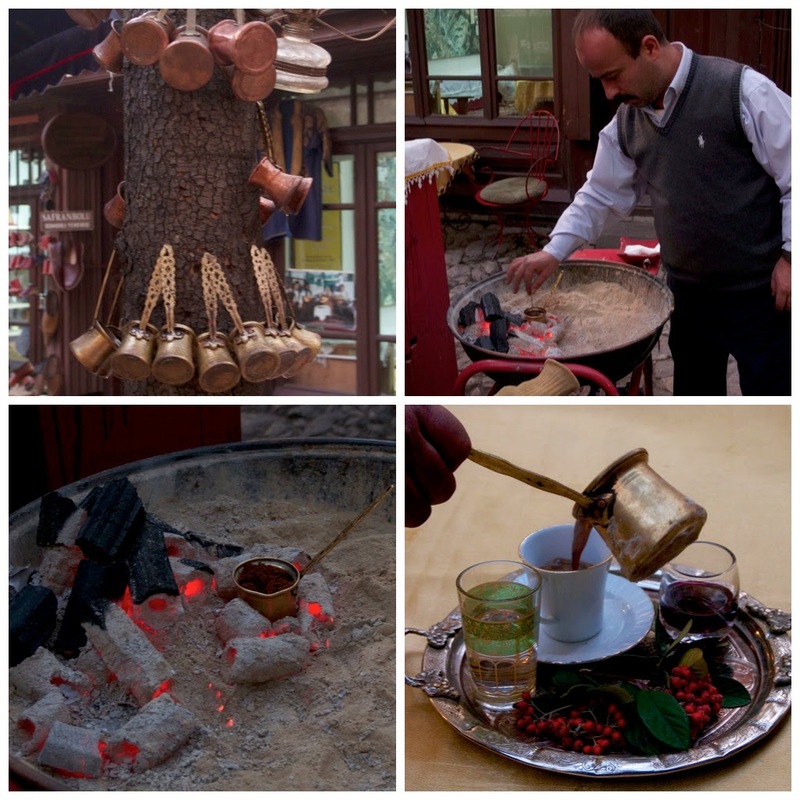 Safranbolu does not have a wide variety of tourist activities, but what we found were some of our best, local Turkish experiences. One shop owner stopped to ask where we were from and showed us how he is famous, as there is a photo of him in a Japanese tour guide from 20 years ago. Another afternoon, we were playing dominoes over lunch outside a cafe and a local man came up, brought us some chestnuts to try and "helped" us play. I use the term "help" lightly, as he was instructing our plays (in Turkish) in playing a completely different game of dominoes. But we did enjoy the chestnuts, which we're pretty sure he just stole from the bin outside the shop next door. But the experience was nothing if not incredibly welcoming. Dinner in the off season involves walking into a restaurant (which may double as someone's home), asking if they have dinner and sitting down in the kitchen to feast. One night we ate at a great little place called Eyvan Yore Mutfagi, where we were seated in the kitchen, the owner pointed to his wife and proudly exclaimed that she was a wonderful cook! We asked if he had children and he told us all about his 3 daughters: career women in Ankara. It was such a treat to be invited into his (wife's) kitchen and family. Plus, the meal was great too! Our last other local experience involved a trip to the Caci Hamami, a Turkish bath built in 1645, and which we were free and welcome to enjoy. I had read different stories about tourist focused baths in Istanbul having men only to do the massage and soaping, and I didn't think I was quite up for that. This hamam was very traditional and so I got the joy of being soaped up by a big Turkish woman in her lacy underwear instead. I walked into the Hamami, not knowing what to expect at all, and was so happy to be welcomed in, language barrier aside. The attendant motioned for me to strip down completely and tie a towel (known as a peshtemal) around me to go into the bath room. I followed her into the most beautiful, domed marble room, where she led me into an alcove next to small sinks of water lining the walls. She motioned for me to sit on the marble bench (by motioned, I do mean "pushed") and then threw a bucket of warm water on me, to indicate I was to do the same for myself. Then she left. After I got over the feeling of, "I don't know what I'm supposed to be doing, and there's no one in here to watch for cues! I'm so nervous!" I just enjoyed the beauty of the room and the tranquility of only the echoey sound of water pouring into the basin next to me. After about 15 or 20 minutes, she came back in her underwear and motioned for me to follow her into another alcove, with a long marble table in the middle. Being used to western notions of privacy and modesty with strangers, I was a little taken aback when she whipped off my towel and laid it on the slab. Then she nicely pushed my naked little self over the slab and motioned for me to lie down. And then I became the human car at the carwash I had read so much about. She poured water over me and scrubbed and polished like I've never experienced, even down to the backs of my ears. After all this, I rinsed off, enjoyed the main room a bit more, got dressed, and then sloshed out of the bath house, cleaner than I have ever been in my life! What to do after such a great experience? 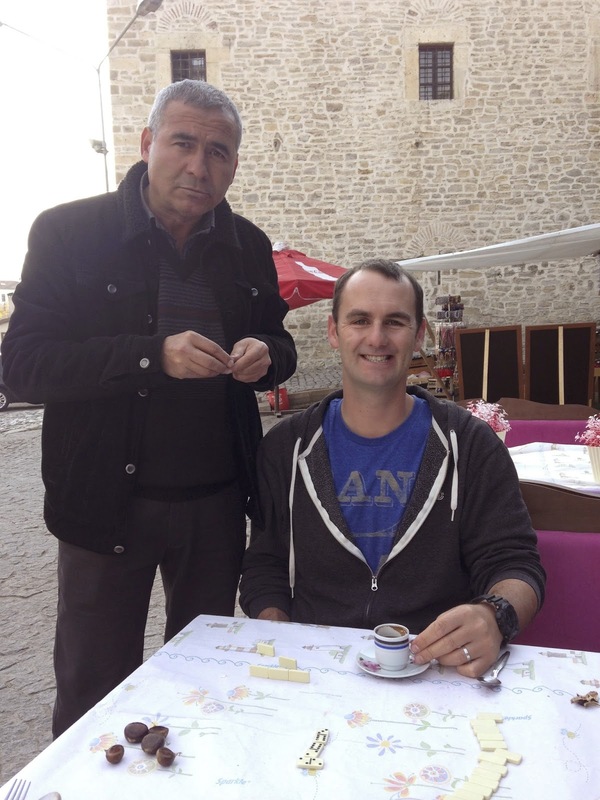 Get the best Turkish Coffee of the trip, right down the cobblestone street outside.